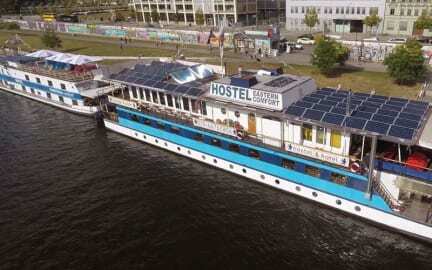 Eastern & Western Comfort Hostelboats i Berlin, Tyskland : Boka nu! Groups take the contractual achievements, that he had ordered or reserved in advance.He remains obligate to the payment of the arranged price in following height: for a cancellation between that 30th and the 21st day before the arranged arrival day 10% of agreed payment, from 20 to 14 days previously 30%, from that 13th until 7th day previously 50%, from the 6th day, until the 2nd day 80%, from the 2nd day, no show or departure prior to pre booked departure 100% of the agreed payment has to be settled. Be aware that we will ask 50% deposit which are different as the deposit / commission that you paid to Hostelworld. For a stay on Western Comfort boat, a 50€ deposit for the whole cabins ´keys will be asked by check in. 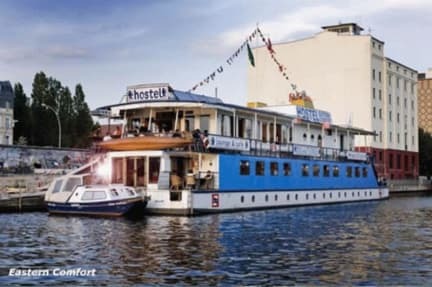 since we consider ourselves a rather relaxed hostelboat ( quiet from 11pm till 8am). “Eastern Comfort” has a total of 25 cabins in 1st ( large cabins for 2 persons ) and 2nd class categories ( for 1,2,3 or 4 persons), all of which have en-suite bathroom & shower. Except our 5bed dorm with shared shower and toilettes. “Western Comfort” – located directly beside Eastern – has 18 private 2 & 3-bed cabins, and shared bathroom/shower facilities. All cabins have two large windows, however Eastern Comfort 2nd class have two portholes in each cabin. Half of our cabins have a river view while the others face the colourful Berlin Wall; waterside cabins are on a first booked basis, and we also do our best to provide a river view for longer stays. Feel free to follow-up with us, but we cannot guarantee the river side. Services and facilities like breakfast, reception and our lounge are on Eastern Comfort and are of course available to all of our guests. Mysigt ställe! Perfekt för dem som vill bo lite annorlunda. Läget var perfekt i ett bra område med många restauranger och bara en tunnelbaneresa bort från centrum. Personalen var väldigt trevlig och hjälpsam, de gav oss många förslag på vad vi kunde göra under vår vistelse. Det enda negativa är väl att rummen var väldigt små (som man kan förvänta sig på en båt) och duscharna + toaletter var i behov av en renovering. Det fanns heller inga lås på någon av duscharna.